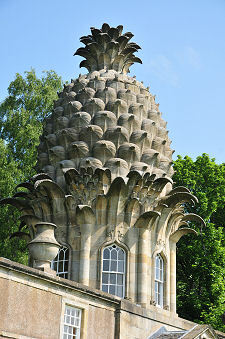 The Pineapple, or the Dunmore Pineapple, is one of Scotland's most remarkable buildings. Standing a mile north of the village of Airth, it was built by John Murray, the 4th Earl of Dunmore, in 1761 as a birthday present for his wife Charlotte. 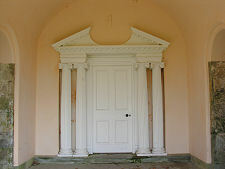 It took the form of a summerhouse from which to view the walled gardens of Dunmore Park,	the family estate. Pineapples had been discovered in the Caribbean by Christopher Columbus in 1493, and over the following centuries had become rare and highly prized delicacies in Europe. 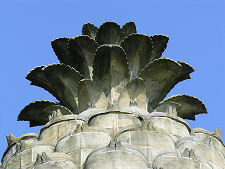 Symbols of power, wealth and hospitality, they had increasingly come to be used by architects to decorate gateways, door lintels and other detailed features on their buildings. 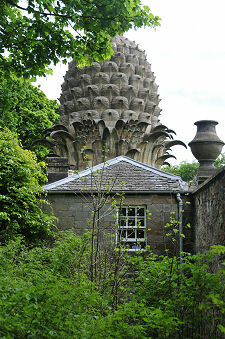 Perhaps this was why John Murray simply decided to build the largest pineapple he could. 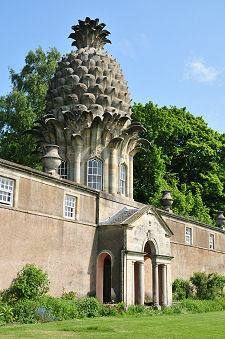 The top of the Pineapple stands 45ft above the level of the walled garden to its south. 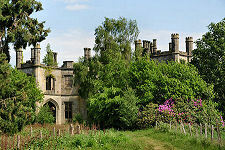 On its the north side, outwith the walled garden, it stands 37ft above the surrounding landscape. 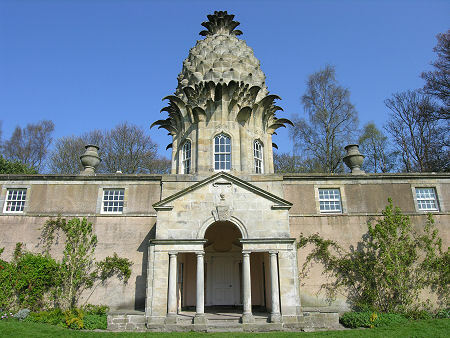 A line of four large stone vases top the wall, two on either side of the Pineapple. These conceal chimneys that originally topped off a heating system within the garden walls. 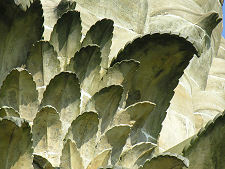 This was intended to promote the growth of exotic specimens (doubtless including pineapples) in the greenhouses that originally lined the inside of the north wall of the garden, either side of the ground-level portico. We tell the story of Dunmore Park separately, but by the 1970s the walled gardens had become overgrown and the buildings adjacent to the Pineapple were in danger of collapse. 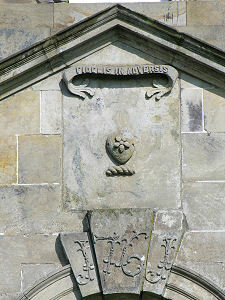 In 1974 the Countess of Perth, who had purchased part of the estate four years earlier, gifted it to the National Trust for Scotland. 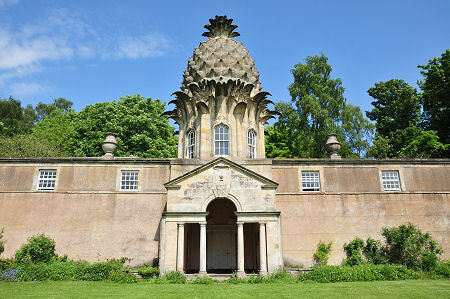 Working with the Landmark Trust they restored the Pineapple to its former glory, and it can now be rented out as a holiday home from the Trust. 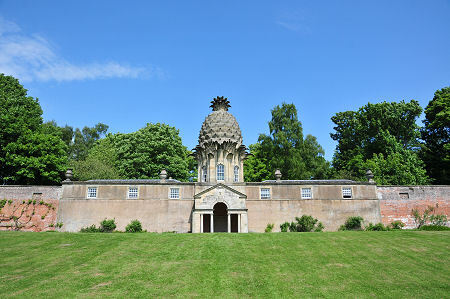 Access for residents is from the north side, while those viewing the Pineapple do so from the garden to the south after parking in the small car park outside the garden. While the Pineapple has been restored, other elements of Dunmore Park have fared less well. In the 1822 a new mansion also called Dunmore Park	(or Dunmore Park House to avoid confusion) was completed here for George, 5th Earl of Dunmore. 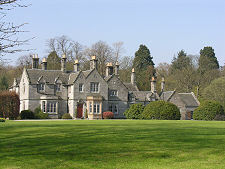 The Murray family continued to live at Dunmore Park until 1911, and it remained in use as a private home until 1961. It was then taken over by a girls' school for a short period of time before being simply abandoned in 1964. In 1970 the Dunmore estate was broken up into lots and sold off. The ruin of Dunmore Park is a sad place. A quarter of a mile north of the Pineapple are the remains of Elphinstone Tower, or Dunmore Tower, which date back to 1504. What still stands is now in a very precarious state. A church built close to the tower in the mid 1800s has been demolished altogether. Perhaps the grandest element of Dunmore Park that is still complete is the parsonage, standing back from the A905 (and glimpsed from it) on the east side of the park. 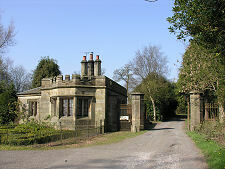 Also surviving is the estate model village, Dunmore, on the banks of the River Forth to the north east of the park. This was developed in the mid 1800s from an earlier settlement called Elphinstone Pans. Near Airth, Falkirk, FK2 8LU.